A hundred ways to a healthier, happier, hipper you! (SPOT.ph) The idea of change can be daunting, especially when we’re all set in our ways. Still, every step counts, and when you start small, all it takes is some willpower, a change in perspective (and maybe a couple of phone alarms) before you’re on your way to a brand new, happier you. Stop looking at change as a chore and instead look at it as something that will benefit you! Yes, it’s hard when your favorite TV show just rolled out every episode of its latest season, but an earlier bedtime is the cornerstone of change in your life. Psychologists say it only takes about 21 days to form a new habit, so the next 79 days should be a breeze! An extra hour (or two) in the morning might just be what you need to finally get on that new hobby/activity/resolution you’ve been putting off for years. Get closer to reaching those 10,000 steps by walking more, and you’ll marvel at what you’ve been missing out on while zooming across the city in cars or cabs. Just remember to pack your trusty umbrella to battle the elements! Since we’re on the topic of things you’ve been missing out on, try changing up your regular route to school or work. You might just chance upon your next favorite hangout spot! Just thinking about the money you'll save by skipping that daily doughnut and ~handcrafted~ coffee makes this worth a shot. Add in all the sinful calories you won't gain by actually preparing yourself a healthy breakfast, and you've got yourself a healthy habit worth starting ASAP. Imagine what a hundred healthy breakfasts can do to jumpstart that aging metabolism, not to mention that aching wallet—if you take your daily coffee at home for a hundred days, that’s nearly 15k in the bank, easy! This one takes immense willpower, but it literally pays off. For a hundred days, set aside a daily amount to save. You can save this money for a rainy day, or you can take it up a notch by investing in the stock market or in a mutual fund. A good trick is to just take what amount you need for the day to avoid the siren call of the mall (or the online shops). Better yet, track your daily expenses—you might just be surprised at extravagant you are! Abide by this one simple rule when dining out, whether in a posh restaurant or in the office cafeteria: NO STRAWS. Our landfills and oceans don’t need more plastic, and you seriously don’t need that straw. Most cities in the metro and even abroad now charge for plastic bags. Save yourself a few pesos, and Mother Earth in the process! Pro-tip: set an alarm for yourself to put your eco-bag back in your bag the next morning so you'll never forget it! Gratitude will never go out of style. For 100 days, start or end your day by writing a thank you letter/text message/email to someone in your life. It can be anyone: a family member, your fifth-grade teacher, or your building’s guard. It's a habit that helps keep us grounded, and would surely put a smile on the recipient’s face! There has been so many things that have happened in this year alone for us to despair, but a little extra boost of positivity might just be the key to brightening up your day when you feel like giving up. Every day for a hundred days, try a little affirmation in the morning. We all know we’re our harshest critics, so it does well to take the time to be actively positive! Take your trusty old camera (or camera phone) and take photos daily for a hundred days to help you see the world in a new light. Photography can be very relaxing, and who knows, you might even get a new smartphone out of it! You read that right: Join the Huawei #NewTakes Challenge, upload a photo that fits one of the four given themes, and you might just take home a brand new phone! Five Huawei P9 units and five Huawei P9 Plus smartphones are up for grabs, so you better send in your entries ASAP. You can send in as many photos as you want until December 20, and we're urging you to send in as many as you can for more chances of winning. A new phone for a new year: ain’t that life changing? 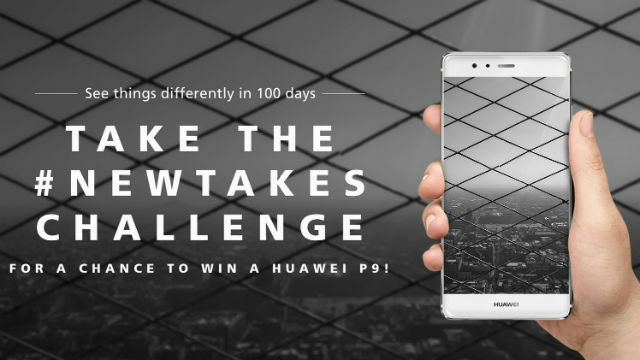 Register for the Huawei #NewTakes Challenge here.